More than likely, unless GM surprises us. Getting frustrated with all the new "packages" that turn out to be only vinyl. GM-Trucks.com speculating a bit on what the new front fascia will look like. Is that supposed to be Equinox sized, or smaller? Either way, Cadillac needs it in showrooms ASAP. Demand for crossovers in general, and luxury crossovers in particular, seems to be insatiable. I think it's D2XX...XT5 is on E2XX SWB. Yeah, has to be D2XX. XT1 is supposed to be on 9BXX and that won't go into production until 2019. Last edited by FenwickHockey65; 02-15-2017 at 04:20 PM. So Chevy has some big news to announce at the Daytona races. Any idea on what it might be? I saw that. It could be the Z/28. They revealed the SS at Daytona. 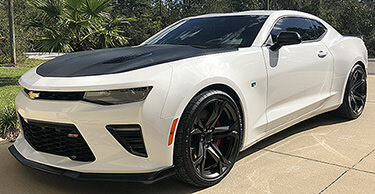 Granted, it was Chevrolet's NASCAR entry but chances are the vast majority of that demographic can't afford a $46k performance luxury sedan.